I was introduced to the buttery flaky happiness of shortbread cookies last fall, and I promised myself that I would return to them in a new recipe. 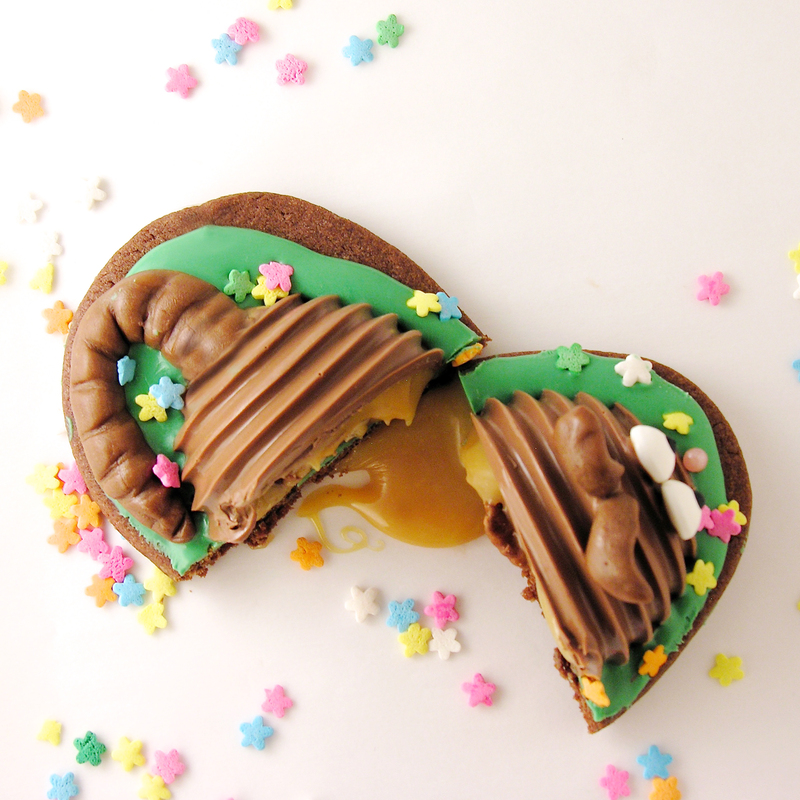 Instead of baking them in cookie form, I baked these in a pan and then covered them with dulce de leche caramel and a chocolate glaze. They are AMAZINGLY good. Really. That good. Look at the pictures…. they are THAT GOOD. 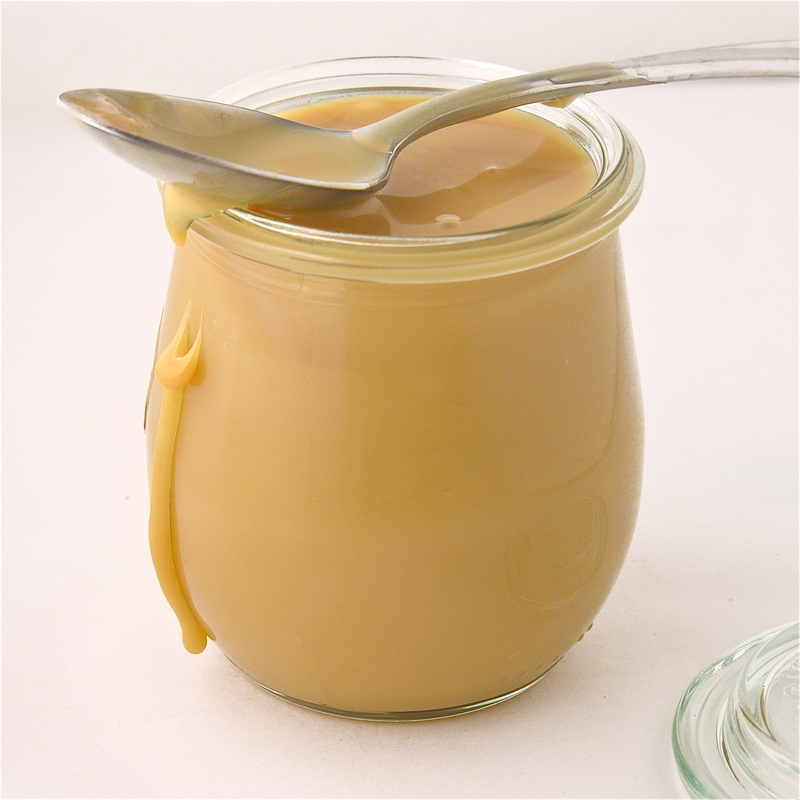 You can make your own dulce de leche using a can of sweetened condensed milk (here’s my recipe for that)- or you can just buy a couple cans of it. I always find it in the Hispanic food section of my local grocery (they have it at WalMart there too). I bought cans for this creation- easy and sooooooo yummy. Add vanilla and mix until well combined. Add flour and baking powder to butter/sugar mixture and beat on low speed until incorporated well (don’t over-beat this). 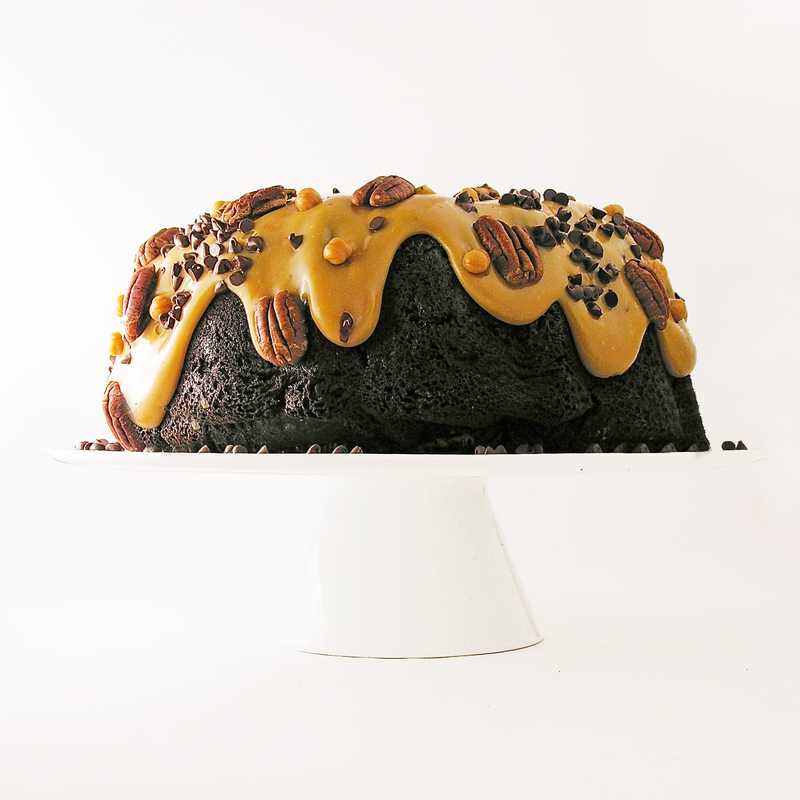 Press into a standard 9×13″ cake pan that’s been lightly sprayed with cooking spray. Bake at 350F degrees for 12-15 minutes until slightly browned on top and firm at center. 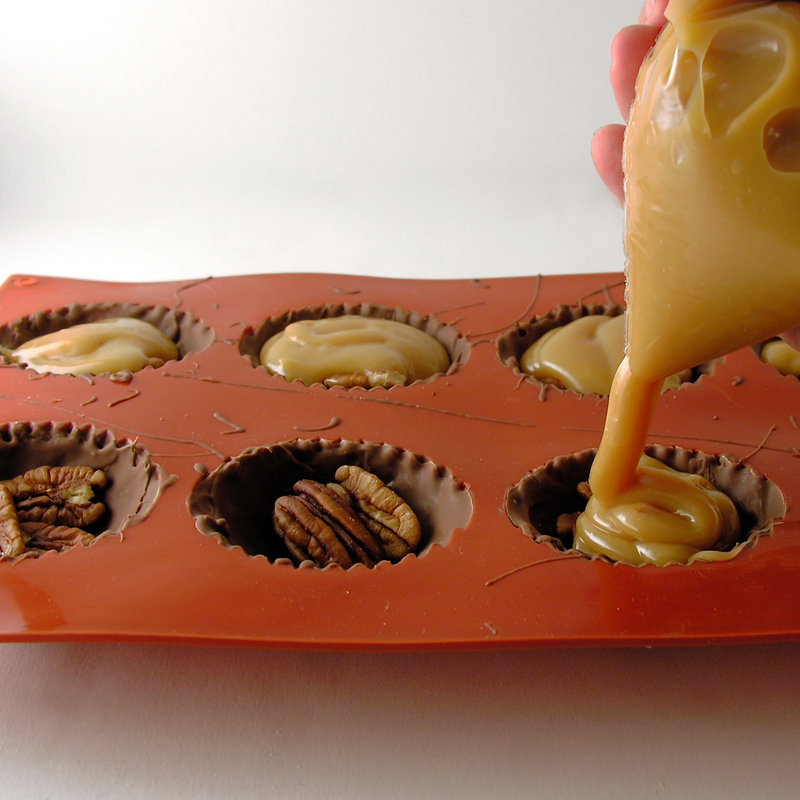 Pour cans of caramel over the top and smooth. 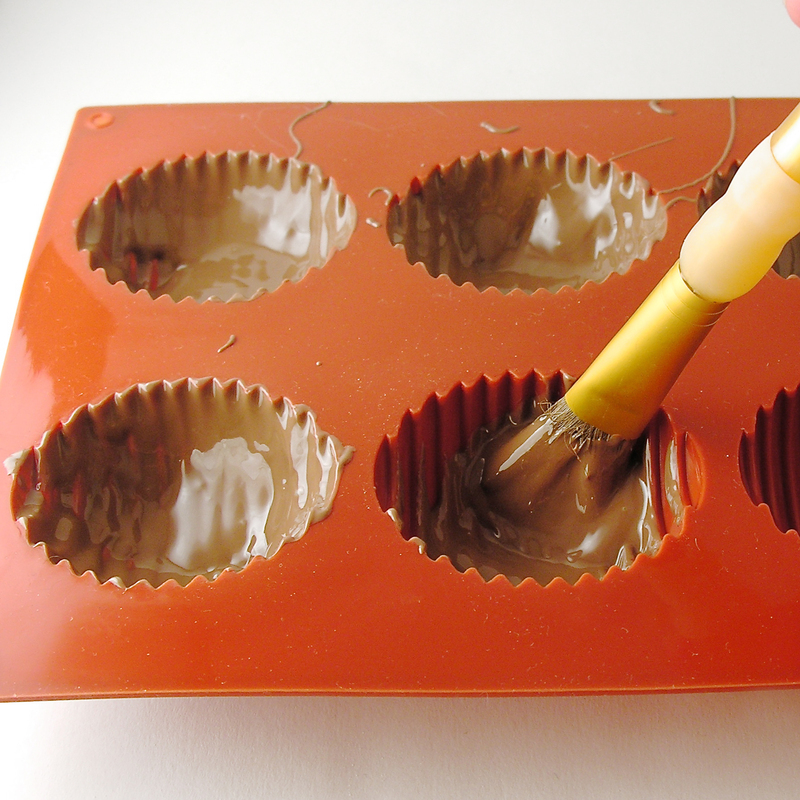 Melt chocolate chips with 6 Tablespoons of butter. 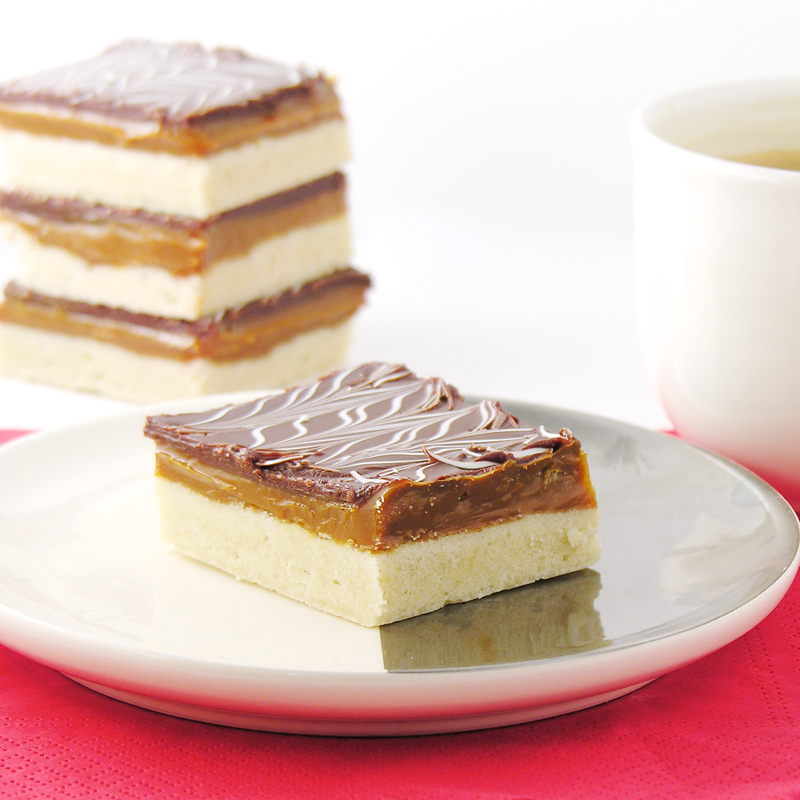 Stir to mix well and pour over top of caramel layer. Smooth top. Before top hardens, if desired, drizzle with white chocolate and pull lines back and forth with a toothpick to make design shown. Chill for at least an hour before cutting. My thoughts: YUM!!! 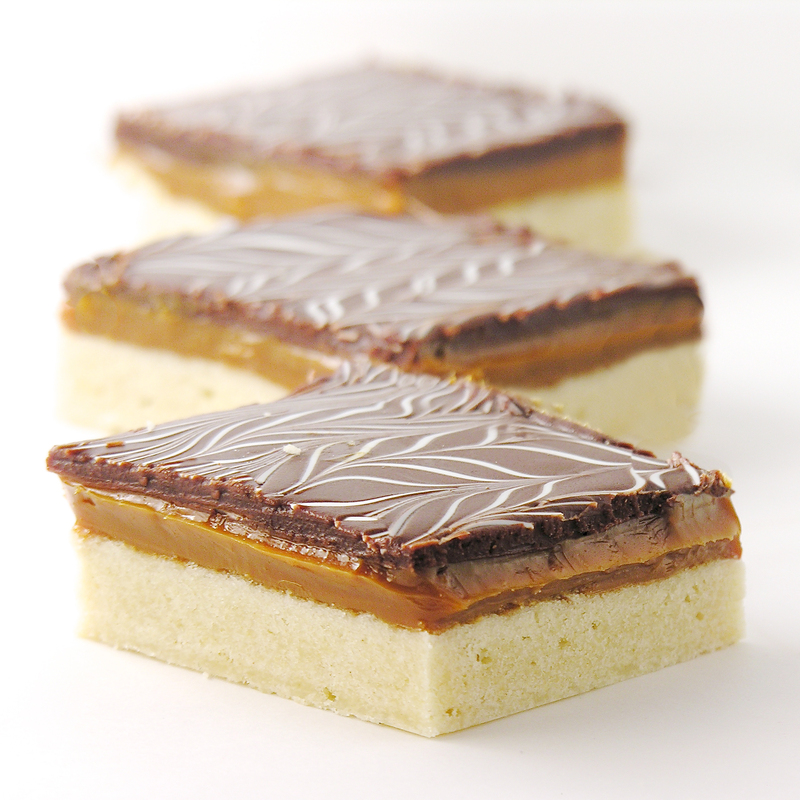 I love shortbread, I love caramel, and I love chocolate! 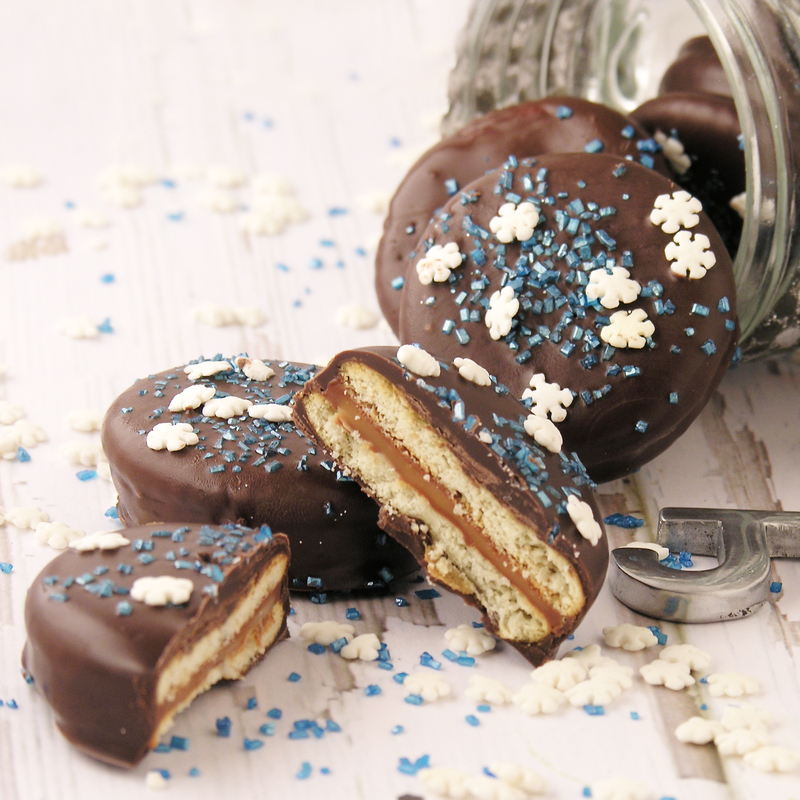 These are fabulous cookie bars! 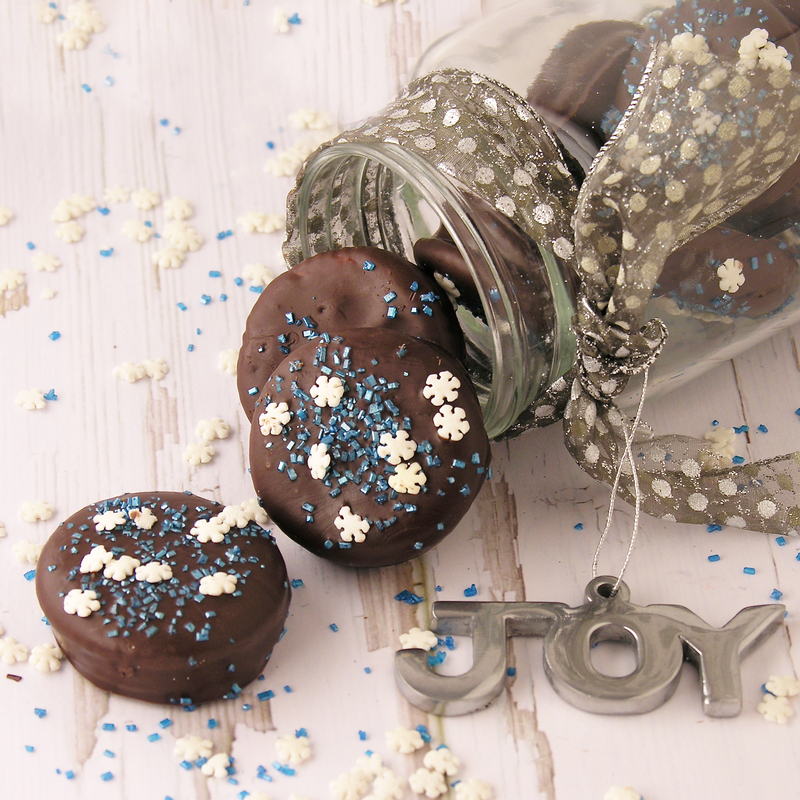 🙂 Be sure to use dark chocolate chips to keep the “sweet” factor down. 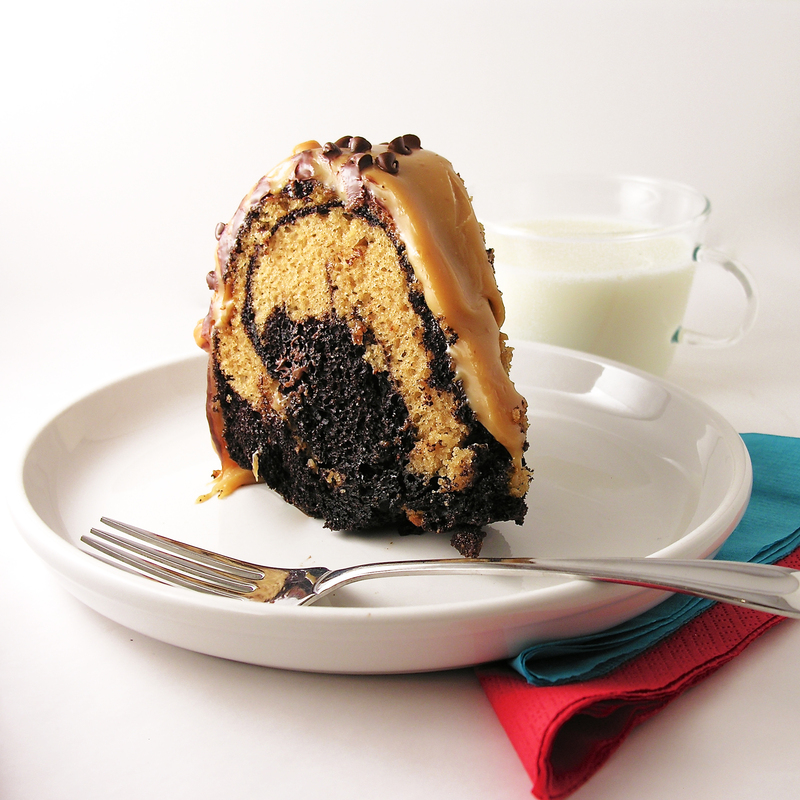 If you want just a touch of caramel, use one can of La Lechera instead of two. 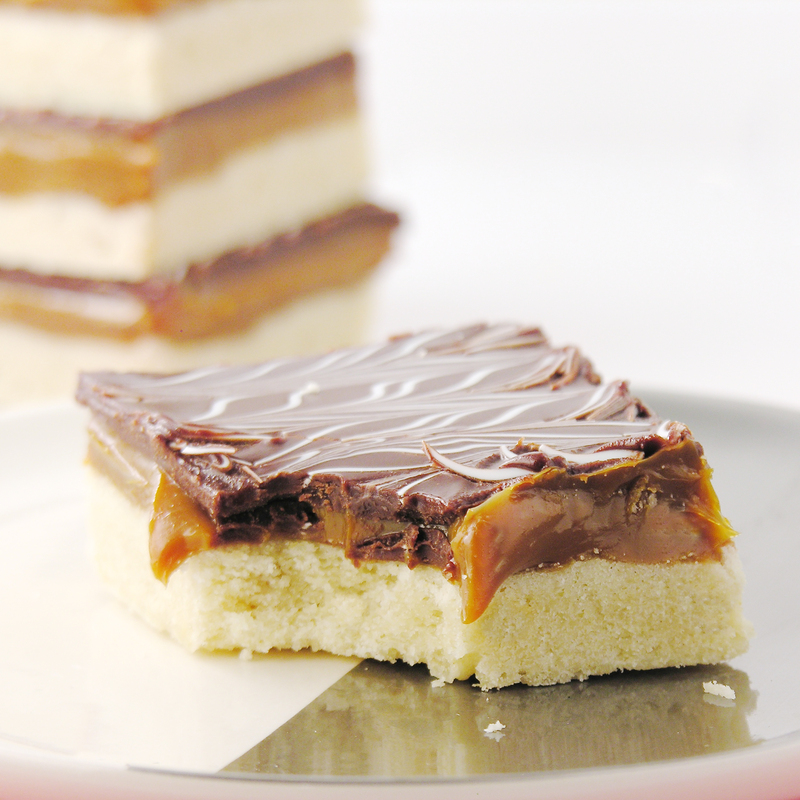 I wanted a big layer of caramel in my cookies- but you might want more cookie and less topping. 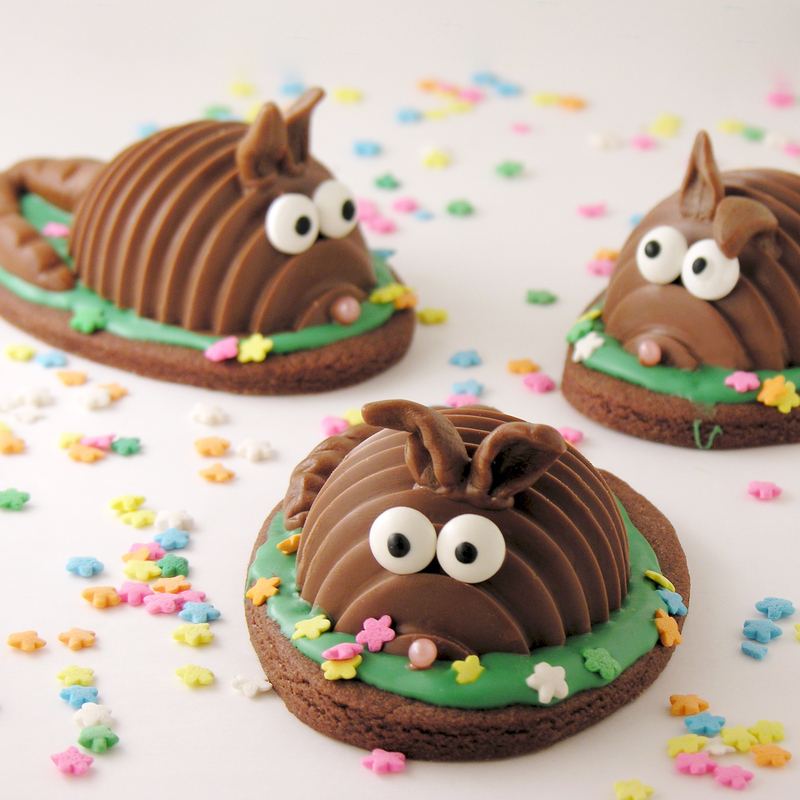 I hope you get a chance to try these!!! ~Enjoy!!! 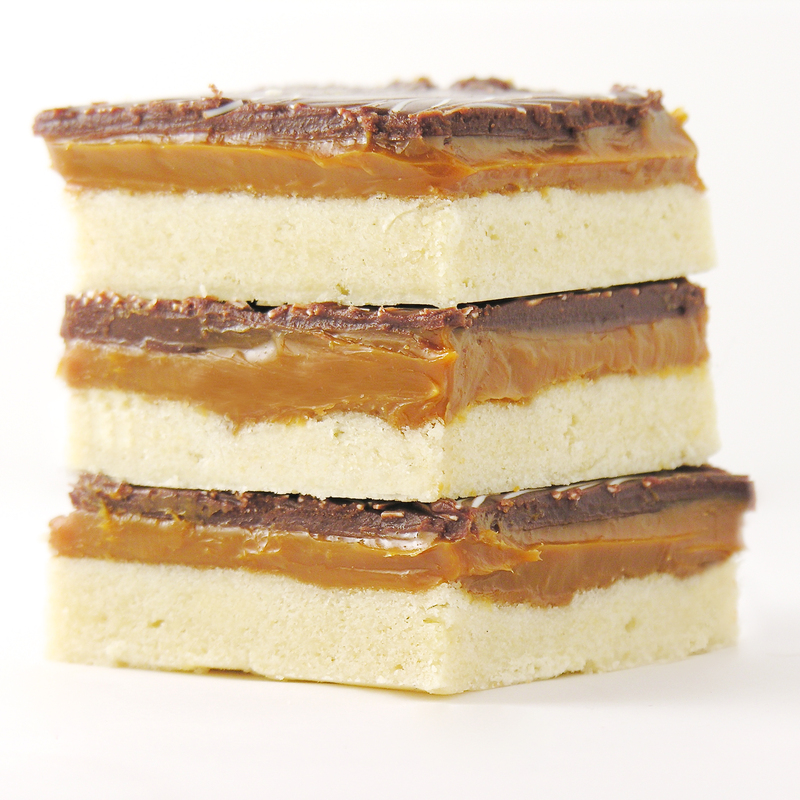 Posted in Bar cookies and tagged best cookie bars, caramel, caramel cookie bars, caramel shortbread, chocolate shortbread, cookie bars, dessert, dulce de leche, shortbread, shortbread bars, shortbread cookies. Bookmark the permalink. 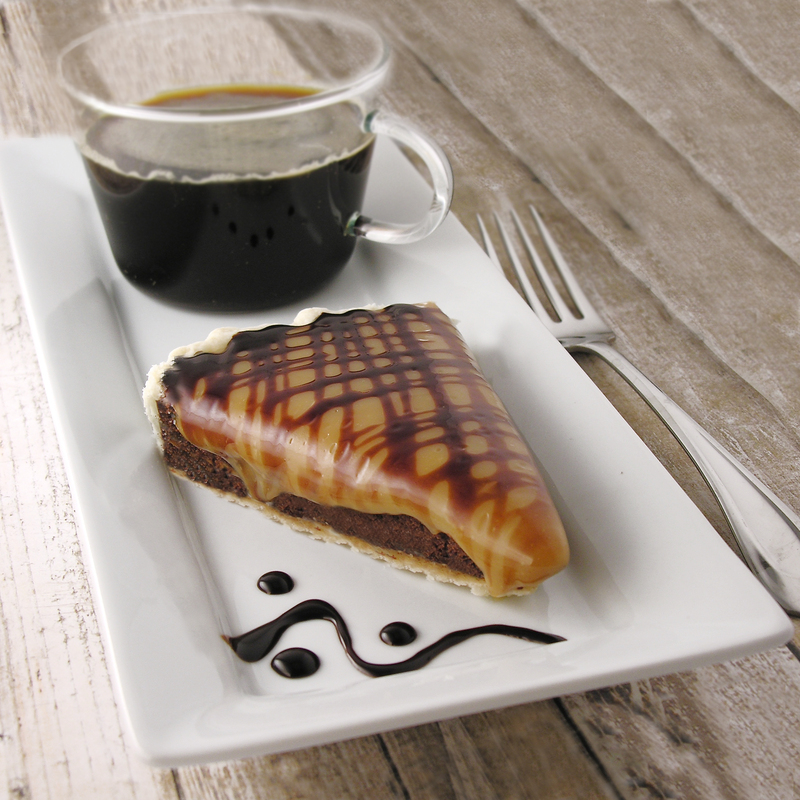 A dense, dark chocolate tart covered in creamy, salted caramel sauce. 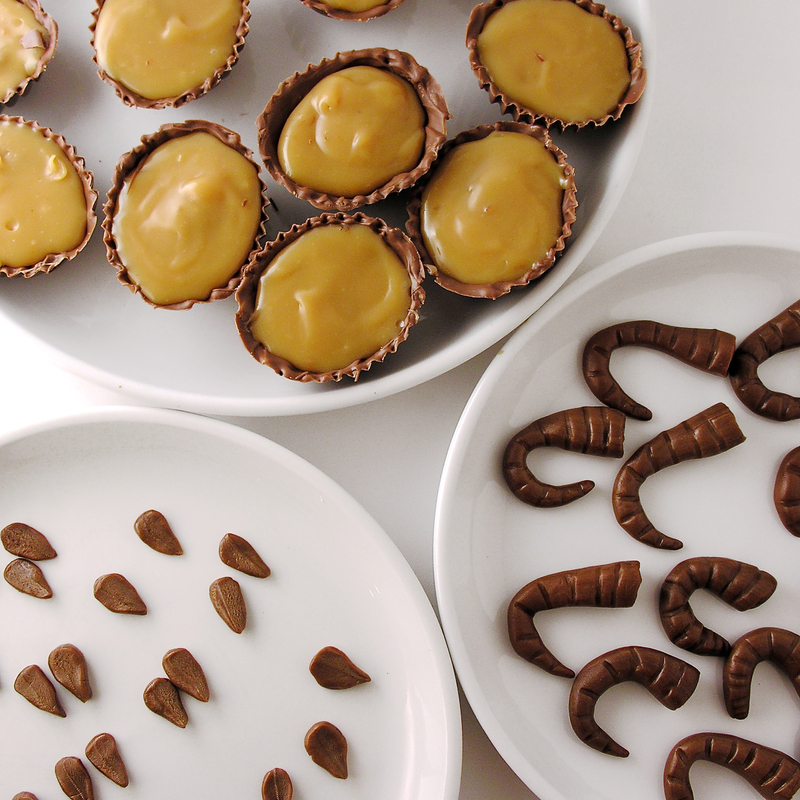 Salty, sweet, and rich dessert flavors!!!! 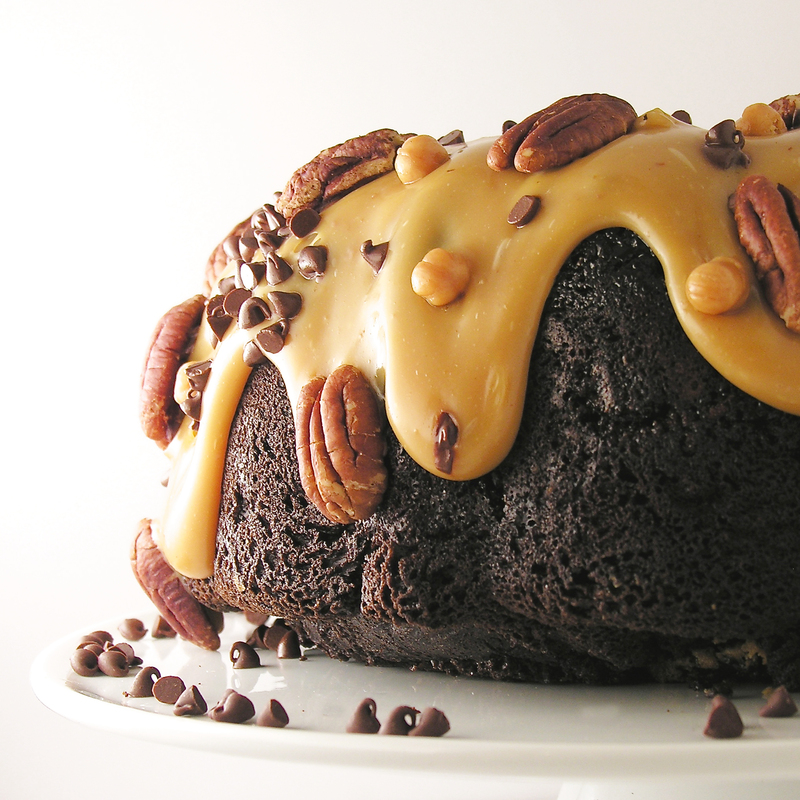 This recipe is a combination of some of my favorite elements from other desserts. 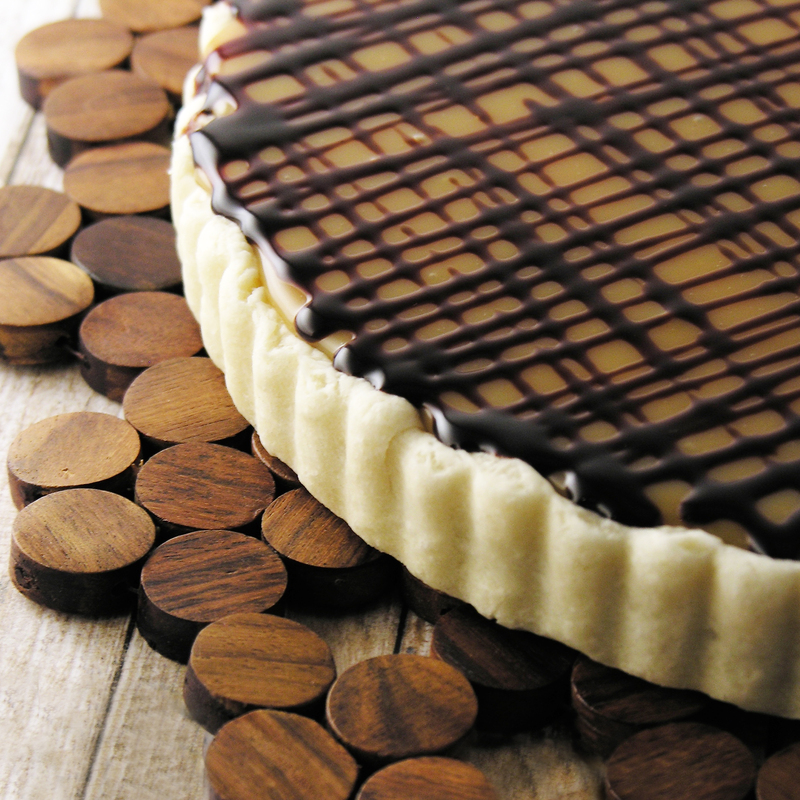 The chocolate tart is the perfect base for just about any topping. 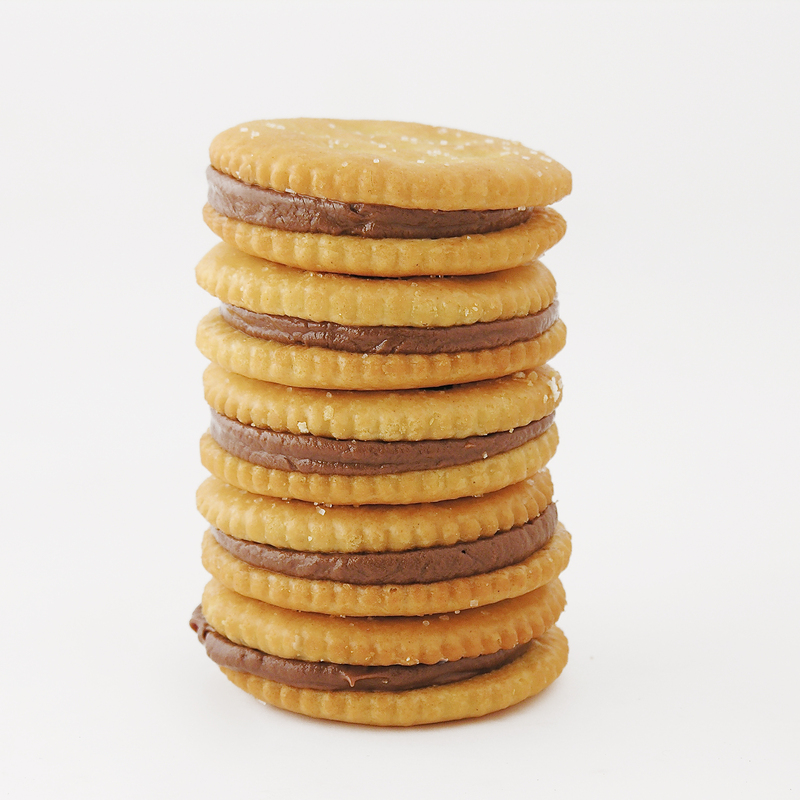 You can adjust it from dark to milk chocolate just by swapping out the type of chocolate you add. 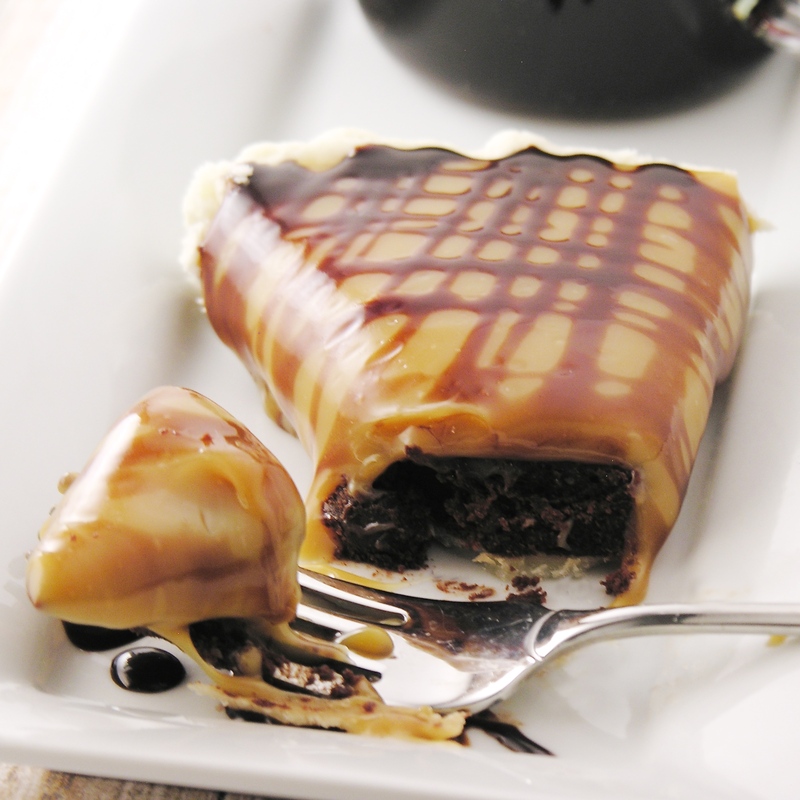 The caramel sauce is my go-to sauce for so many recipes. It’s not from-scratch, but it is honestly better (and soooo much easier)! That caramel layer does firm up after being chilled- but I wanted to cut into this right away- so these pictures show it in all of the gooey happiness that happens just after baking. Yum! 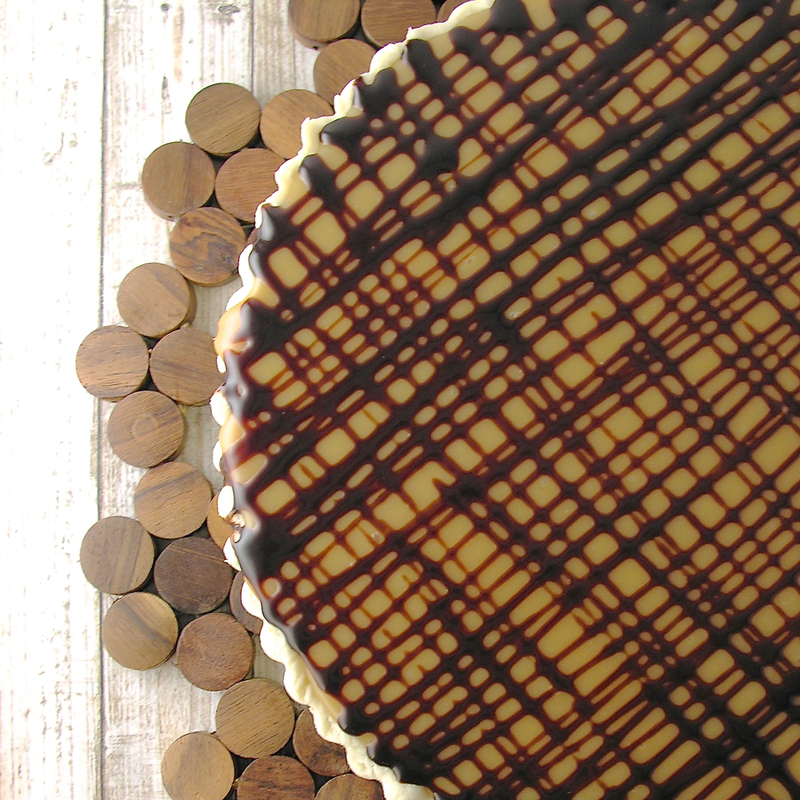 Spray a 9 inch tart pan with cooking spray and line with pie crust. Poke holes into bottom with fork and set on a cookie sheet. 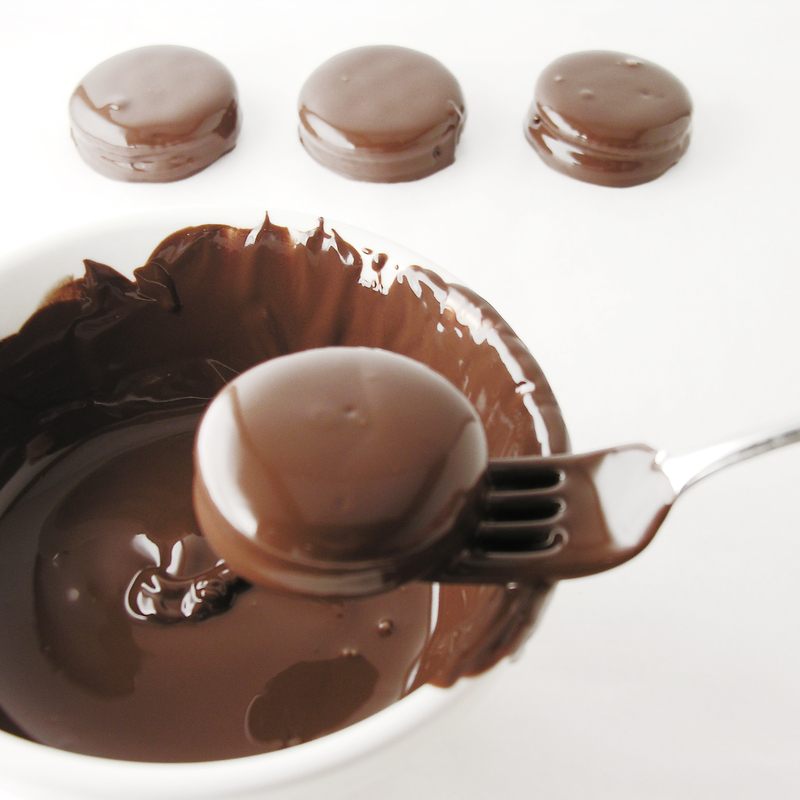 Melt dark chocolate chips. 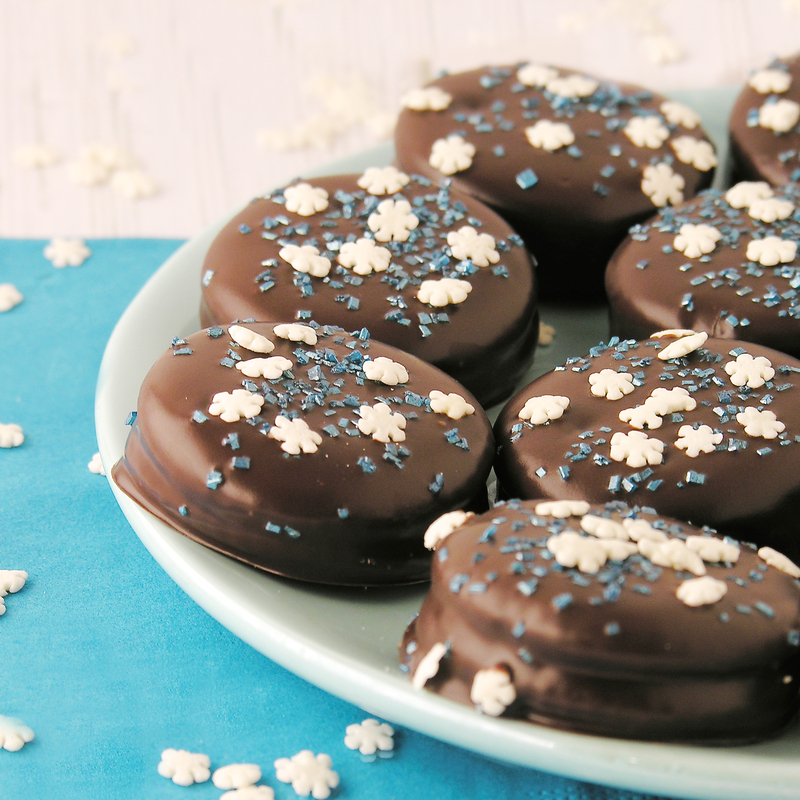 Allow them to cool to room temperature. In a separate bowl combine eggs, cream, vanilla and powdered sugar. Add cream mixture to chocolate and blend well. 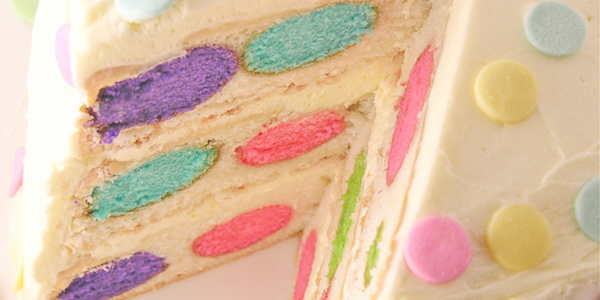 Pour into crust and bake for 20 – 25 minutes until center is set. 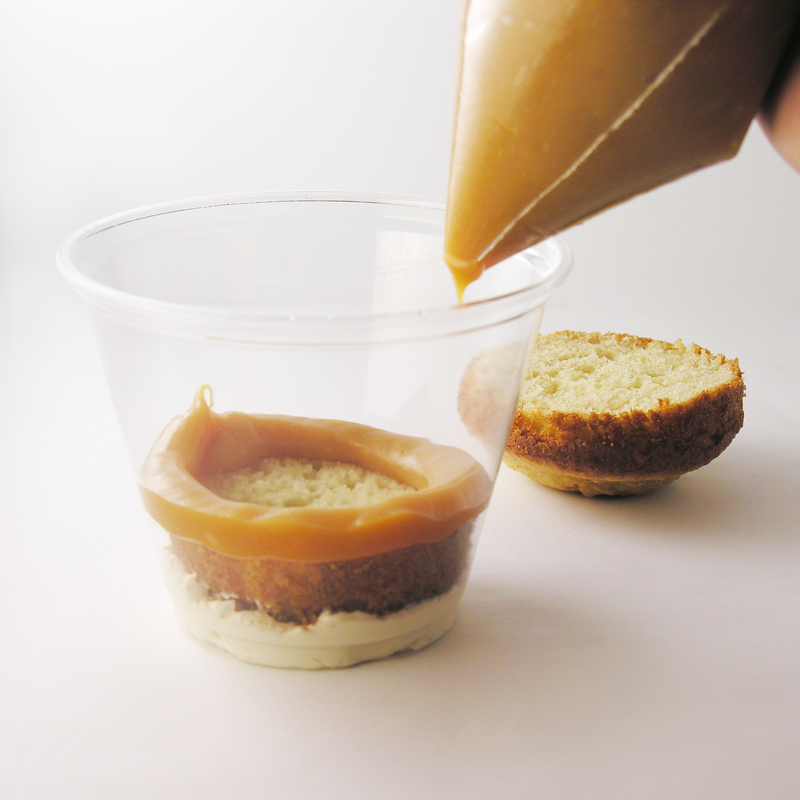 While tart is baking, make caramel sauce by placing caramels, condensed milk and butter into a medium saucepan. Heat over medium/high heat, stirring constantly, until melted and smooth (about 6 minutes). 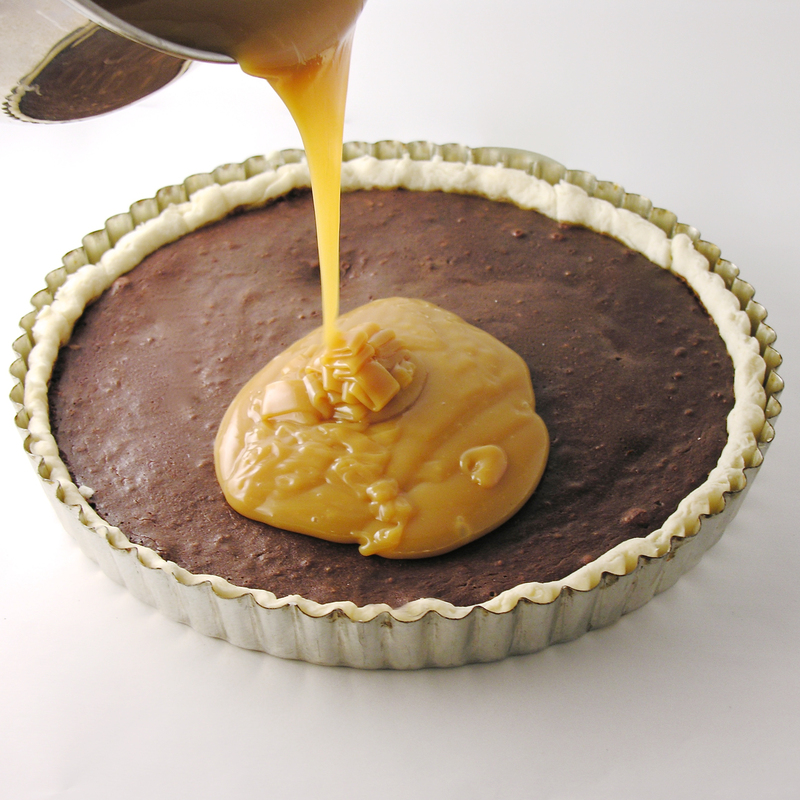 Allow caramel to cool in pan a bit, and add salt, mixing well to combine. Remove sides from pan, serve and enjoy!!!! 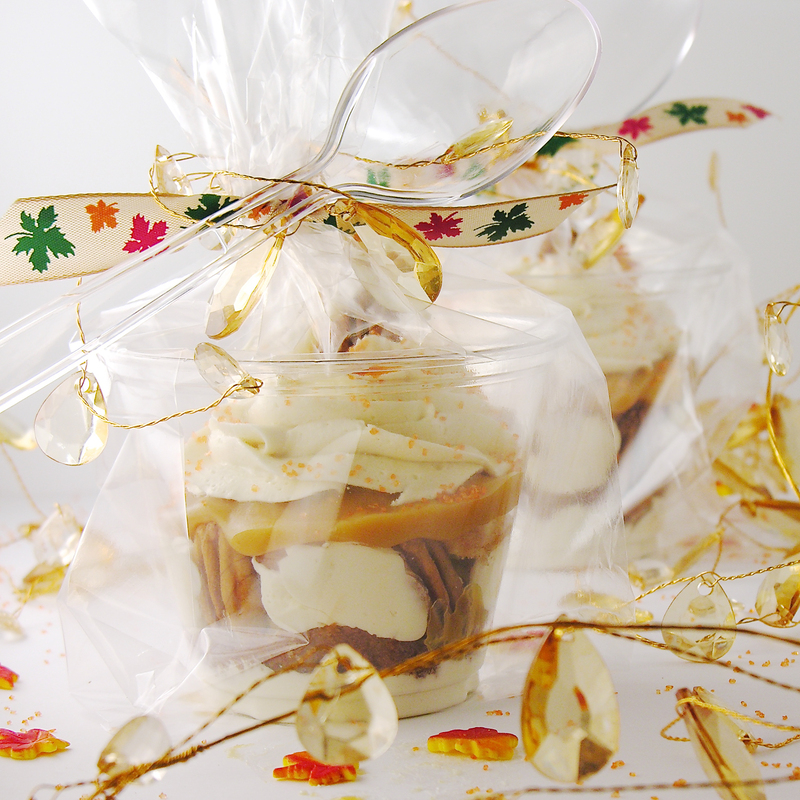 Posted in Candy, Tarts and tagged caramel, caramel dessert, caramel recipe, caramel tart, chocolate, chocolate recipe, chocolate tart, dark chocolate, dessert, fall dessert, fudge, recipe, salted caramel, salted caramel recipe, salted caramel tart, thanksgiving dessert. Bookmark the permalink. 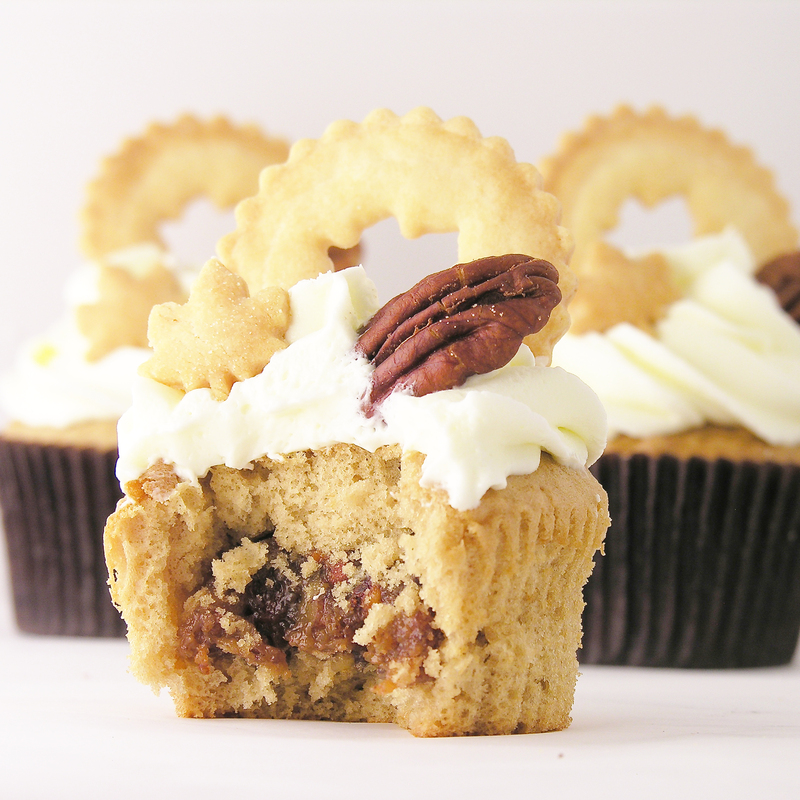 If you like pecan pie, you will go nuts over these cupcakes! 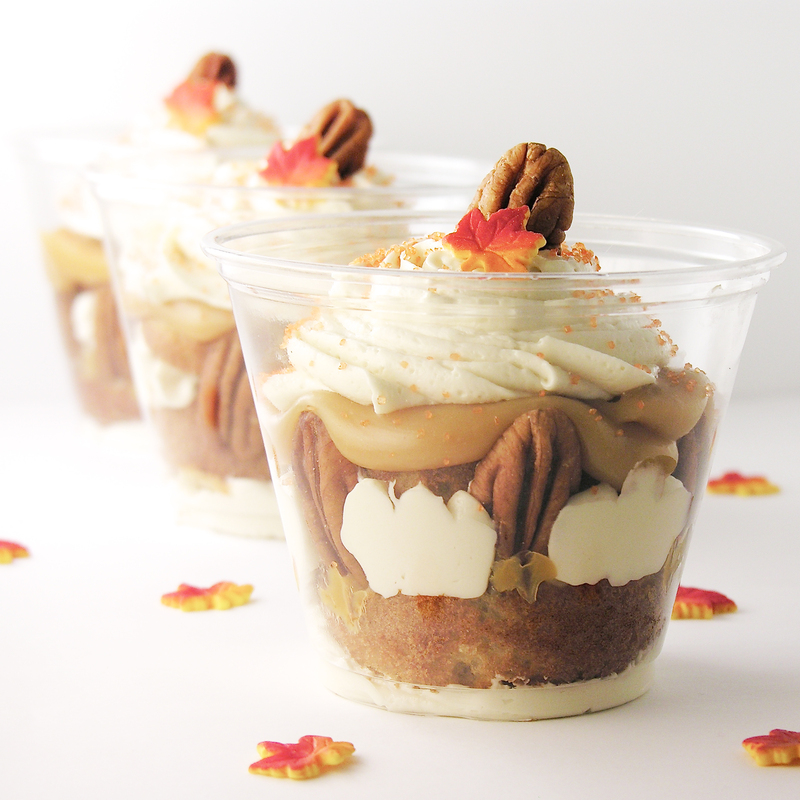 With caramel pecan pie filling in the middle and crisp pie crust decorating the top, these say Happy Thanksgiving in a fun new way! 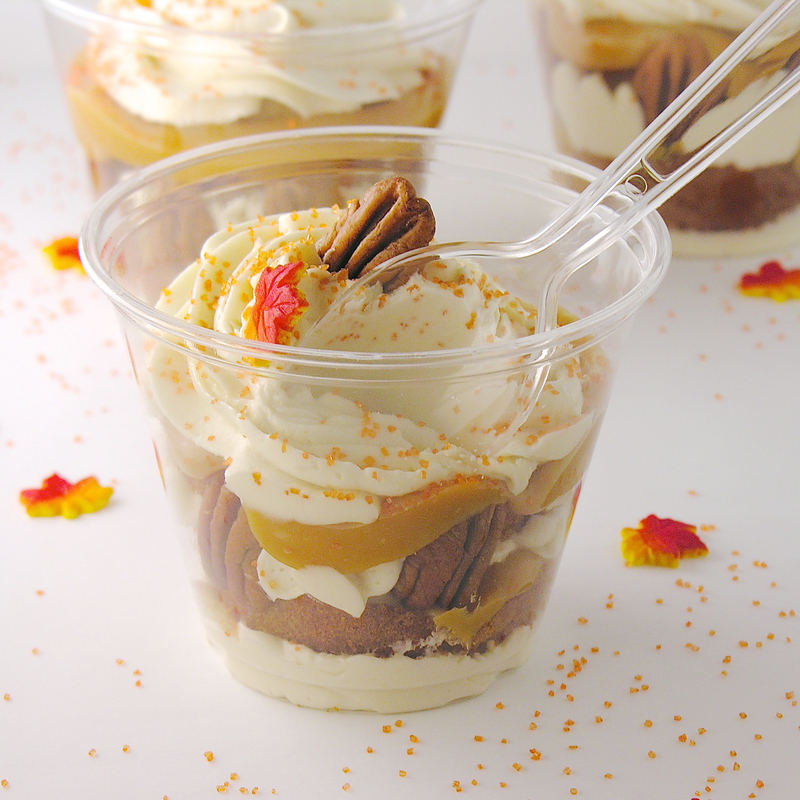 There’s nothing more yummy than a warm caramel pecan pie in the fall. 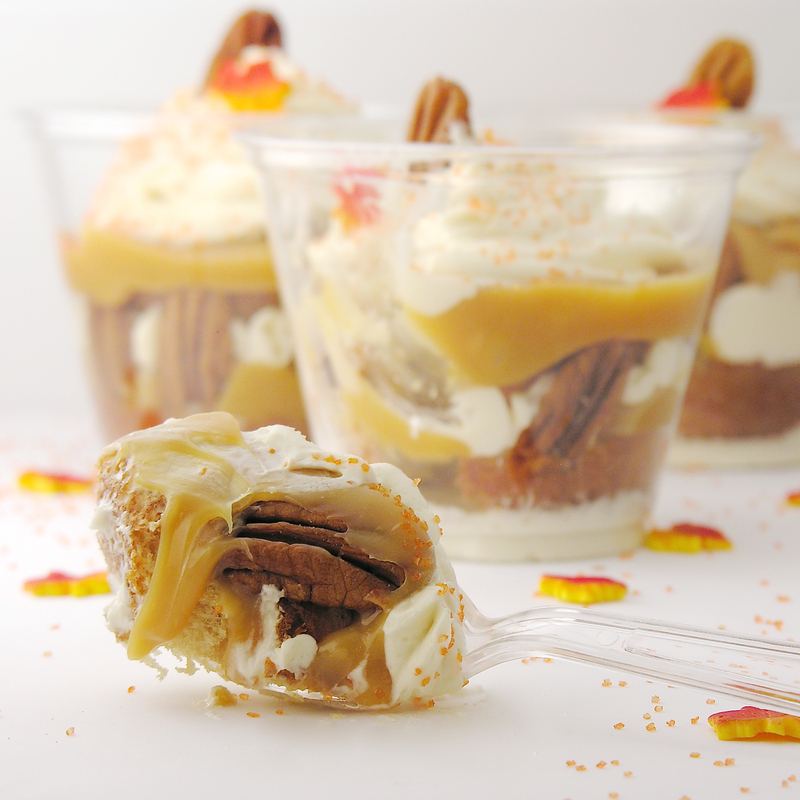 I have a favorite- and it’s here already on Easybaked as my Christmas Eve Caramel Pecan Pie. 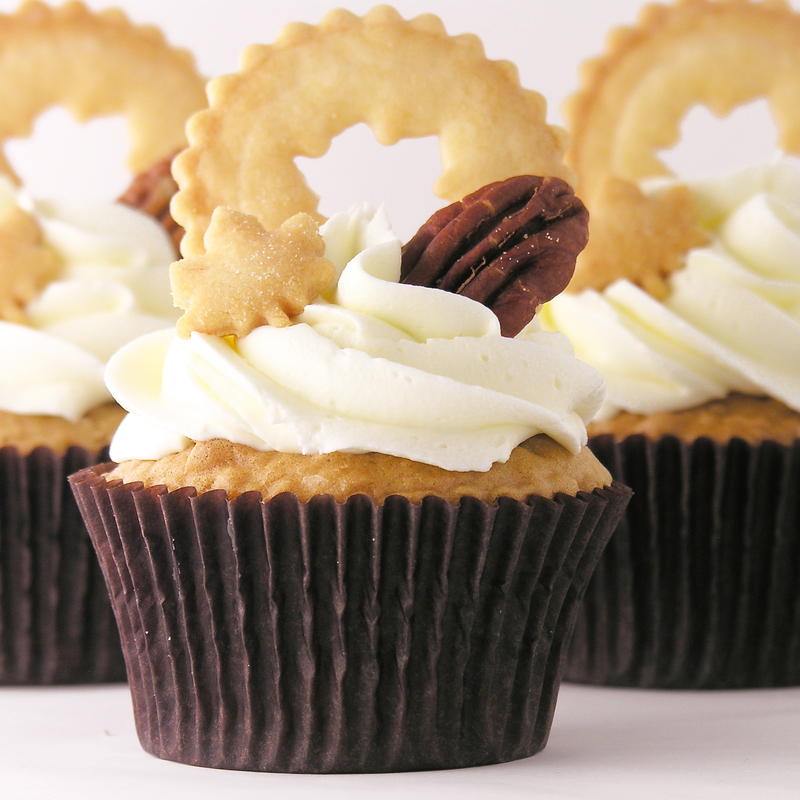 These cupcakes take that pie up a notch and they turned out better than I even imagined they would~yum! There are a couple of steps to this recipe, so it is a little more time consuming, but well worth the effort~ I promise! In a large mixing bowl, beat 3 eggs together lightly with a fork. Pour into a greased casserole dish and bake for 50-60 minutes. 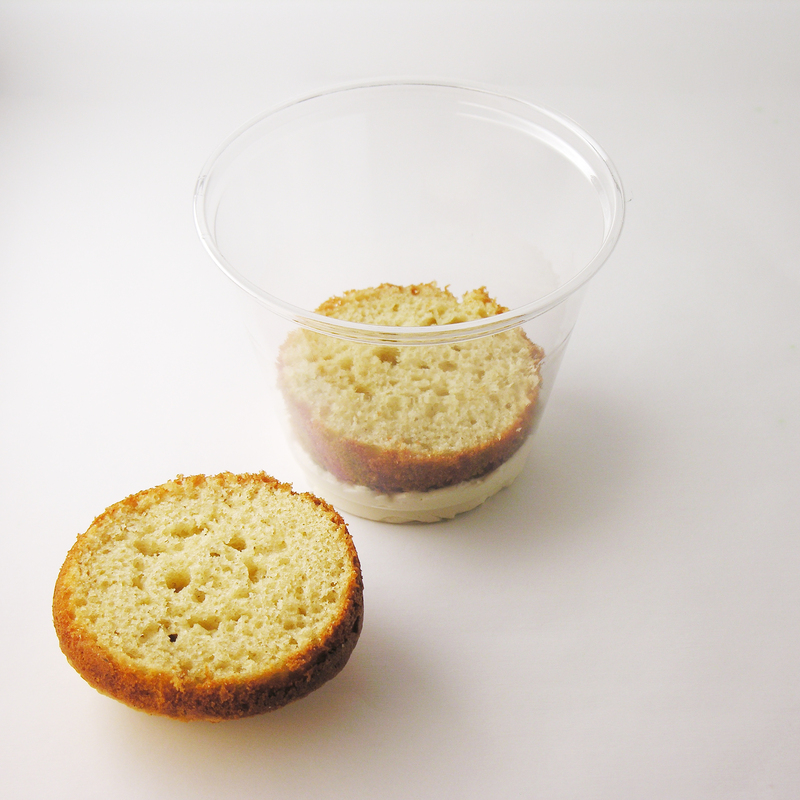 As the pie filling bakes, make cake mix according to directions on boxed mix and divide evenly among 24 cupcake liners placed in a tin. Once pie filling is finished, bake cupcakes according to box. 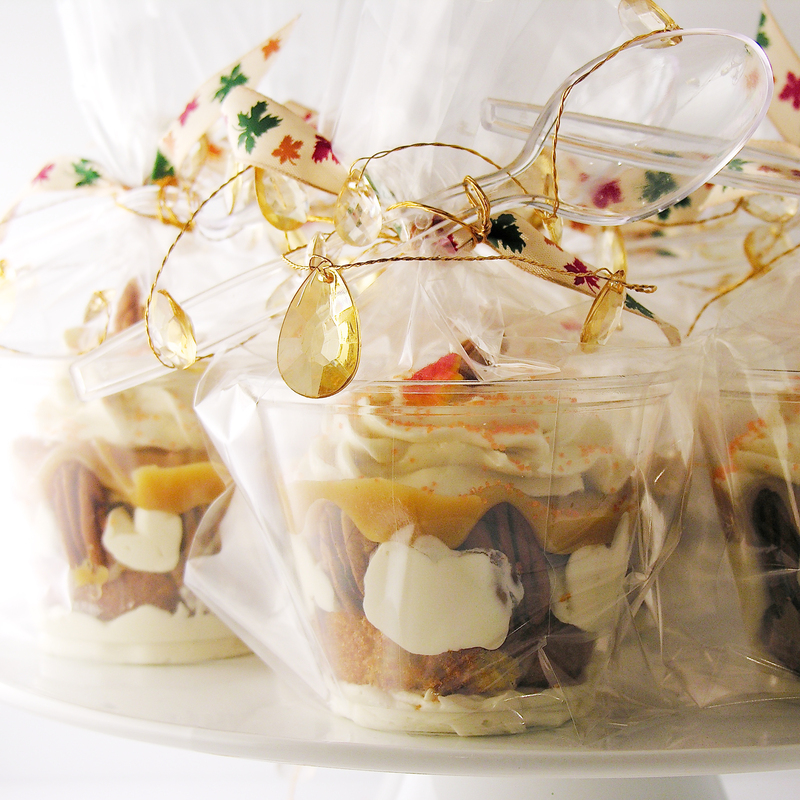 Remove cupcakes from oven and tins and allow them to cool completely. 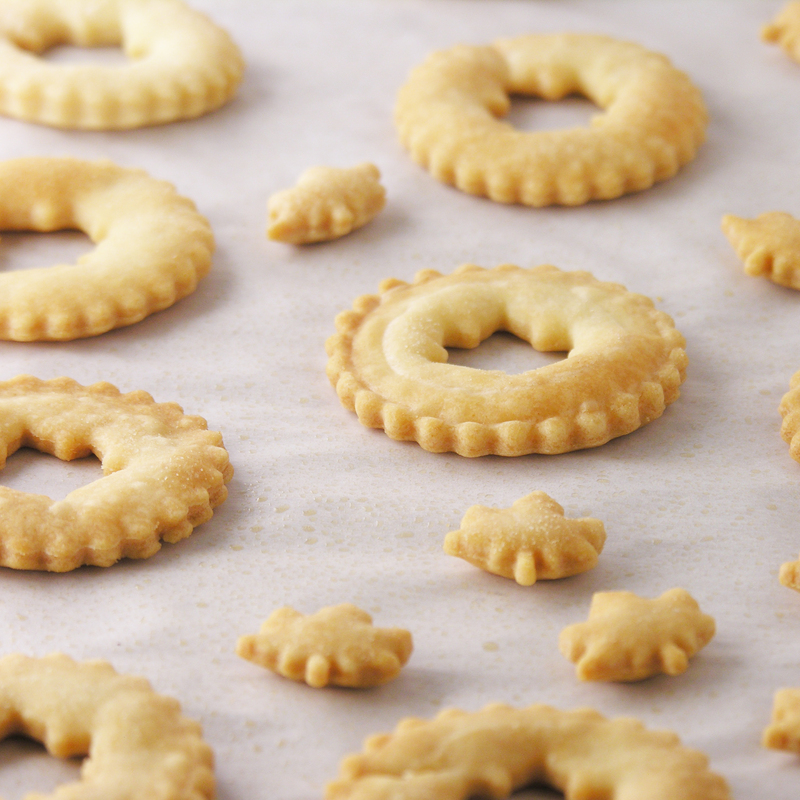 Unroll pie crust onto counter and use any cookie cutter you like to cut into 24 pieces. 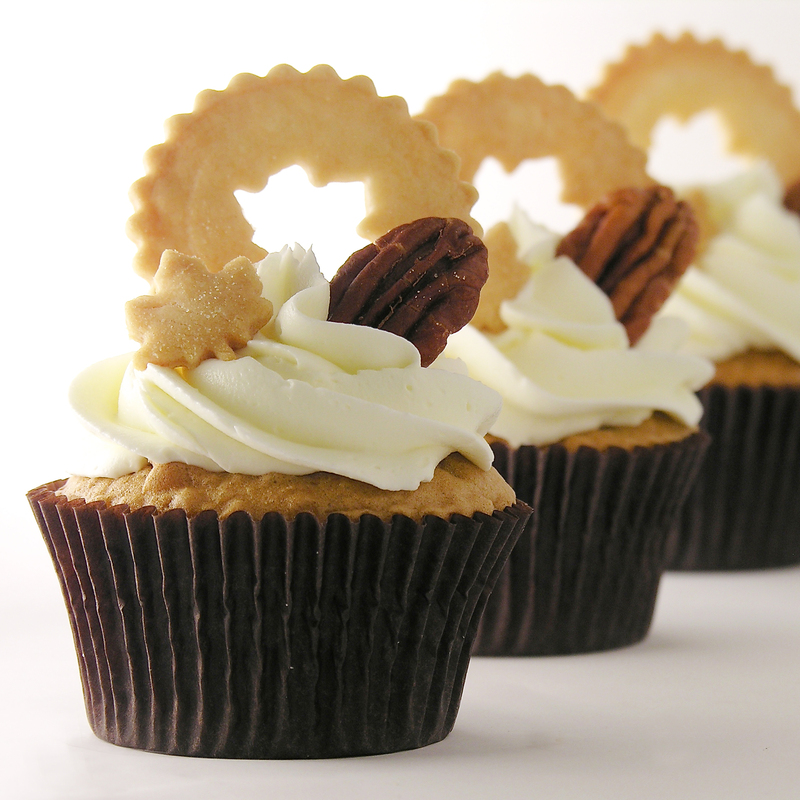 I used a fall leaf Linzer cookie cutter and added the leaf cut-outs on the cupcakes too. 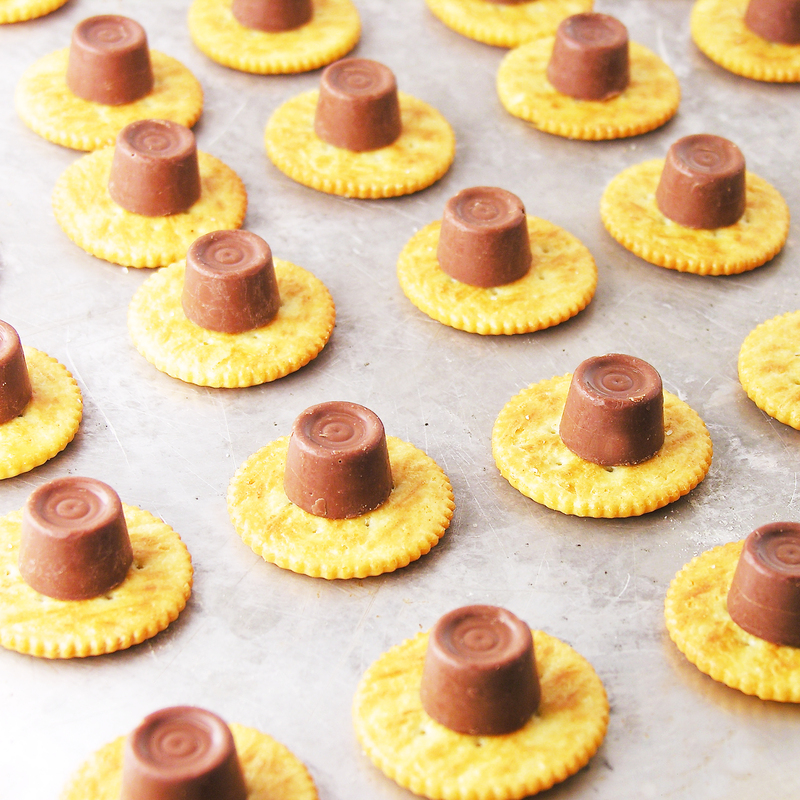 Place pie pieces on a cookie sheet and spray lightly with non-stick spray. Bake until slightly browned and crispy. Cool. Make frosting by combining butter, powdered sugar and vanilla in a large mixing bowl and beating on high for 3 to 4 minutes until light and fluffy. To assemble cupcakes, make sure everything has cooled. 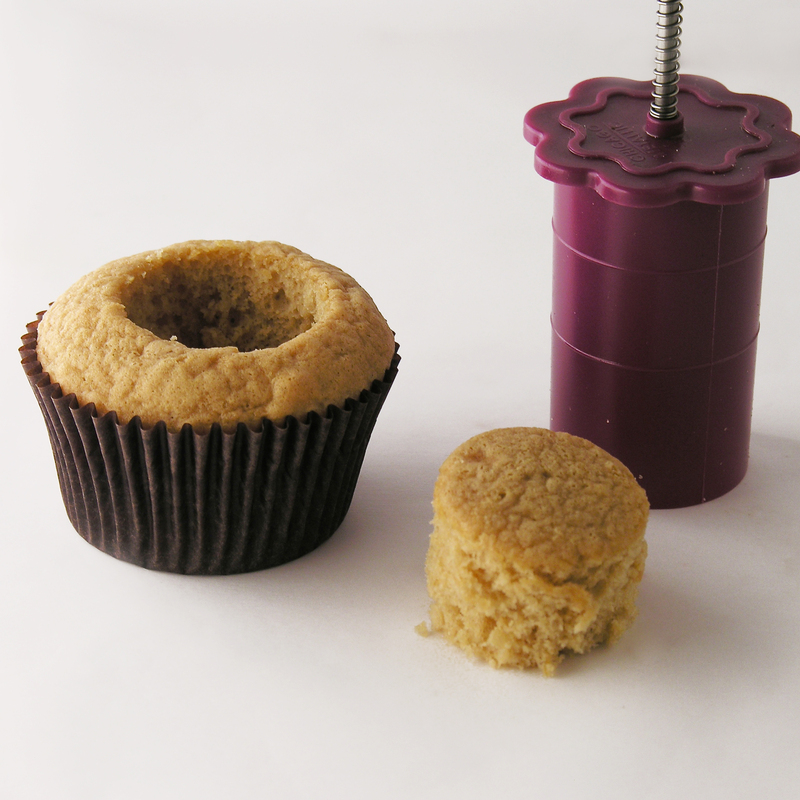 Use a cupcake corer to remove a core out of the center of each cupcake. 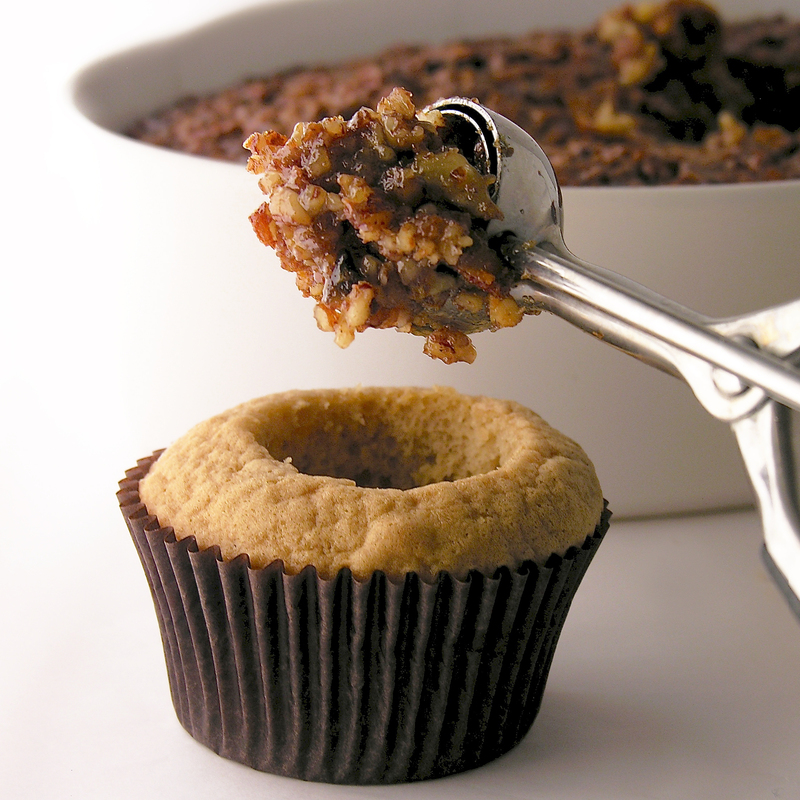 Scoop or spoon some pie filling into each cupcake and replace the top of the core back on top of the filling. 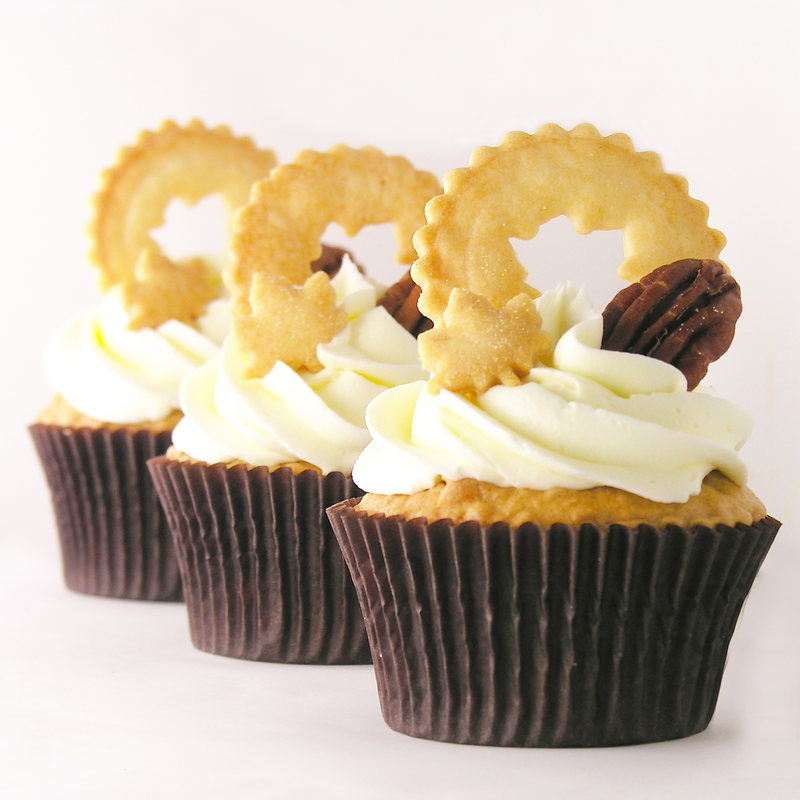 Place frosting into a zip-top bag fitted with a decorating tip and pipe swirls of frosting on the top of each cupcake. 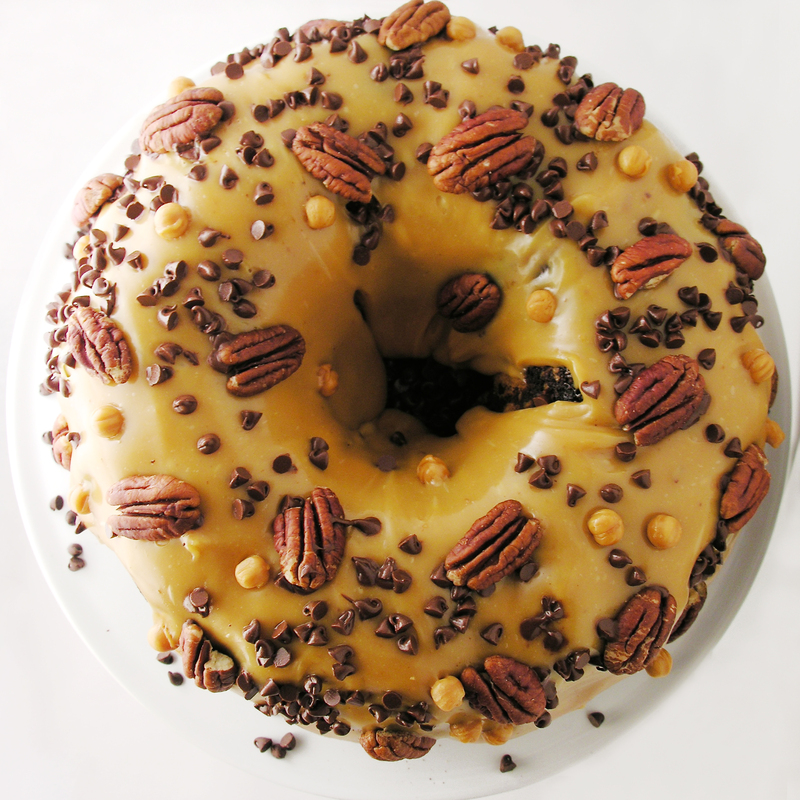 Add a pie crust topper and a pecan half and ENJOY!!!! 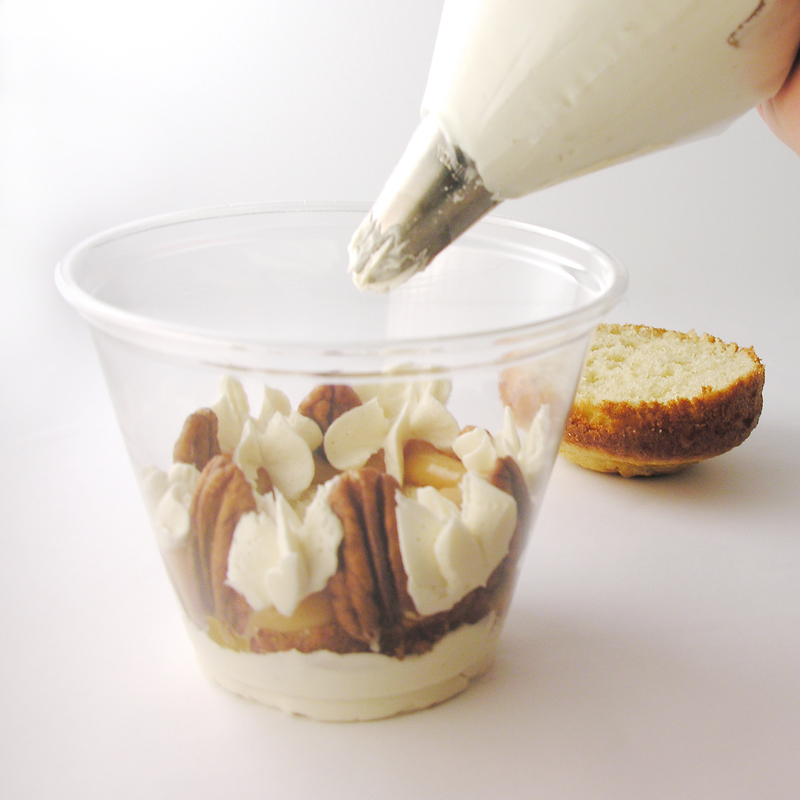 Love pecans? We do too! 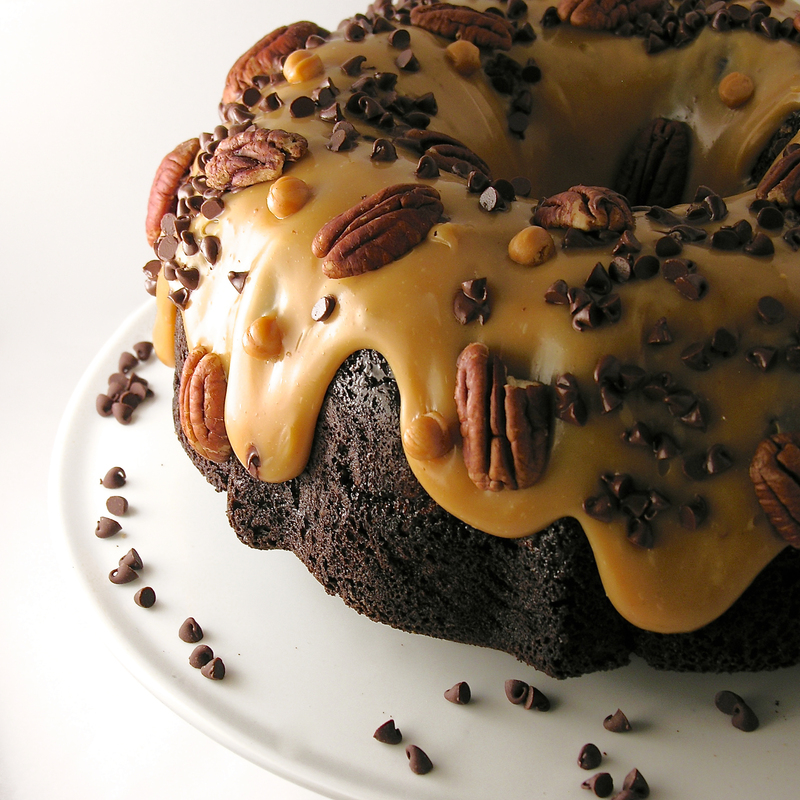 Here are some other yummy pecan recipes. Just click on a photo to see the recipe! 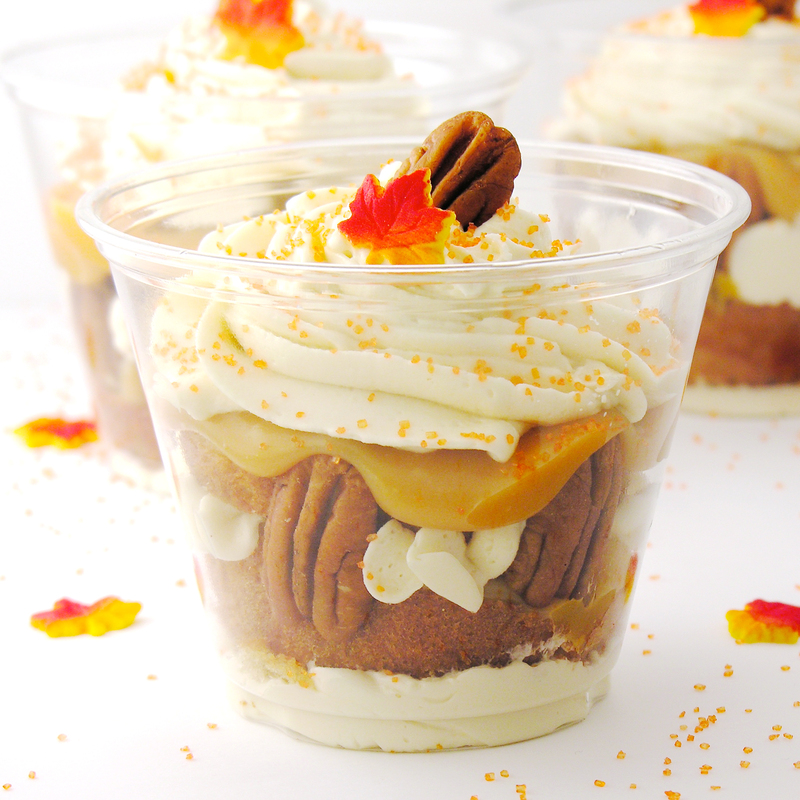 Posted in Cupcakes and tagged buttercream frosting, caramel, caramel cupcakes, caramel sundae topping, chopped pecans, christmas, cupcakes, dessert, filled cupcakes, pecan, pecan pie, pecan pie cupcakes, pie crust, pie crust cut-outs, recipe, thanksgiving. Bookmark the permalink.